The Security Council on Wednesday quickly approved a request from Lebanese Prime Minister Fouad Siniora for U.N. help in investigating the assassination of Industry Minister Pierre Gemayel. The 15-nation council unanimously approved a letter inviting the U.N. commission investigating the 2005 murder of former Lebanese Prime Minister Rafik al-Hariri to also help the Lebanese authorities bring Gemayel's killers to justice. The U.N. inquiry led by Belgian Serge Brammertz is already looking into 14 other apparently politically motivated attacks in Lebanon since Hariri's killing, and Brammertz has reported evidence that all 15 cases were linked in some ways. Gemayel's slaying would bring the total number of cases under U.N. investigation in Lebanon to 16. John Bolton, the U.S. ambassador to the United Nations, said Washington hoped the Brammertz investigators could begin helping out on the Gemayel murder "as rapidly as possible, while the crime scene evidence is still fresh and before obstruction of justice can take place." 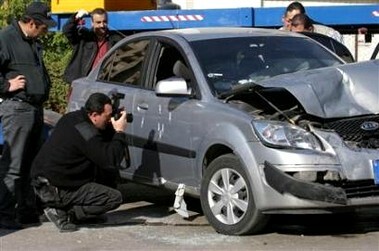 Gemayel, an anti-Syrian cabinet minister, was gunned down in his car at point-blank range on Tuesday near Beirut. He was killed after a cabinet vote to tentatively approve U.N. plans for a new international court to try suspects in the Hariri murder and the 14 related cases. The cabinet of Prime Minister Fouad Siniora, in which anti-Syrian ministers hold most seats, voted after the resignation of six opposition ministers in a maneuver seen by many in Lebanon as an attempt to block creation of the special court. Lebanon's pro-Syrian president, Emile Lahoud, protested that the cabinet vote was illegitimate. But following Gemayel's slaying, the Security Council pushed ahead on Tuesday with U.N. approval of the plan, which now requires formal approval from the Lebanese government. The latest assassination nonetheless pushed the Siniora government deeper into crisis. The death or resignation of two more ministers would bring it down. "The situation is delicate, it is very fragile, and we should all do whatever we can to support the Lebanese people and the government and encourage them to stand united," U.N. Secretary-General Kofi Annan told reporters. Several prominent anti-Syrian leaders have blamed Syria for Gemayel's death and warned that more killings could be in the works. Damascus has denied any role in the Gemayel and Hariri assassinations. "This was an attack on the Lebanese government, the planned international tribunal and the United Nations," former Hariri chief investigator Detlev Mehlis said in an interview published in Germany's Sueddeutsche Zeitung on Wednesday. "The indications after this attack point to elements that want to topple the Lebanese government. These are the so-called pro-Syrian elements in Lebanon. They have an obvious motive," said Mehlis, who led the U.N. probe until Brammertz took over.